Whether you’re auditing a website or doing keyword research to form the bedrock of a content marketing campaign, doing your SEO homework is essential to understanding exactly what information your customers are searching for. Most businesses carry out this research with some type of SEO software, the most popular of which is probably SEMrush. Chances are you’ll have heard of SEMrush already – after all, it’s a platform used by over 1.8 million companies and individuals all over the world, including huge household names like eBay, Booking.com, Quora and Hewlett Packard! But for those who haven’t, SEMrush is a comprehensive piece of SEO software which helps users to find profitable keywords, analyse their website performance and gain an insight into their competitors’ SEO activity. Now, we think SEMrush is great (and you can read why we think so in this article), that’s why we use it ourselves. However, with the most basic package starting at $99.95 a month, we recognise that it could be pricing out some freelancers, smaller businesses or those just getting started with keyword research or content creation. So, since not everyone has the SEO budget of eBay and Hewlett Packard, we’ve compiled a list of fantastic alternatives to SEMrush capable of providing similarly excellent results without breaking the bank. Long Tail Pro is a straightforward piece of SEO software which specialises in helping you to find and evaluate long tail keywords that you can rank more highly for in Google. Long tail keywords are highly specific search terms, usually around three or four words long. Because they’re so specific, they can often signify a stronger purchasing intent from the searcher: for example, a person searching for ‘guided walking tours in London’ is much more likely to purchase a tour than somebody else searching for ‘walks in London’. Even better, long tail keywords also tend to be easier to rank for, since fewer people are competing for them! Long Tail Pro has a simple interface and plenty of other useful features that make it a great alternative to SEMrush. The software is designed to clearly illustrate which search terms are easiest to target by bringing together a host of relevant metrics in one easy Keyword Competitiveness value. Meanwhile, a Rank Value identifies the keywords that could be most profitable to your business. When it comes to tracking your progress, all of the information can be filtered and exported however you need it, and the platform also boasts a Competition Analysis tool which provides a detailed overview of others targeting similar keywords. Verdict – a clear, easy-to-use tool for those who like to keep things simple. Cost: Prices start at $37/month $27/month with this exclusive offer! Another platform focused on finding long tail keywords with low SEO difficulty is KWFinder. One of 5 tools developed by the whizzes over at Mangools, KWFinder is a similarly straightforward piece of software, perfect for anyone looking to perform in-depth keyword research through a user-friendly interface. Again, the platform finds a range of keywords related to your search and calculates a difficulty score based on factors such as page authority and external links. A clear traffic-light system then indicates which terms your competitors might have missed. On top of that, the platform also enables you to organise your keywords into lists, hide search terms that aren’t profitable and even filter results based on region, country or even city. With keyword difficulty and Google Search Engine Results Pages (SERP) analysed in real-time, KWFinder promises “the most accurate” results on the market. And, with a database of more than 1.35 billion keywords, you won’t be running out of keyword suggestions any time soon! Verdict – a good-looking tool for more data-driven businesses, with a large database and localised results. The first of the more comprehensive SEMrush alternatives is SpyFu. An all-in-one tool for SEO and PPC, keyword research and link building. Specialising in competitor analysis, SpyFu promises to improve your SEO strategy by providing a range of insightful data on rival businesses competing for your search terms. Enter any keyword into the search bar and you’ll get a whole host of useful information. This includes the top websites for that keyword over time; stats such as search volume, daily clicks and calculated value of an organic click; and a history of rank changes to help you time your content perfectly. You can also get all the usual useful features, such as related keywords to inspire new content ideas, keyword grouping to help plans your campaigns and a backlink builder to help you rank for the search terms you identify. Where things get even more interesting is with SpyFu’s competitor analysis. 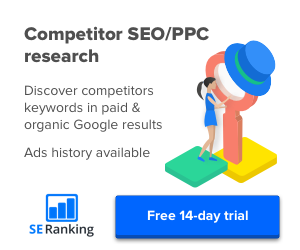 Search for a rival business and you can view a whole host of information, such as every keyword they’ve ever bought or ranked for on Google, and every ad variation they’ve run. It’s a cool feature that allows businesses to emulate the success of their competitors – and avoid their pitfalls. Verdict – a great in-depth tool, perfect for those who may venture into paid activity later down the line. The next option on the list is Serpstat. Another solid all-rounder, Serpstat offers a range of useful tools and features to help you develop an effective and profitable search strategy. 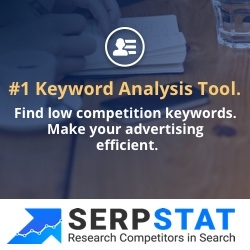 Taking the keyword research as a starting point, Serpstat compares keywords based on performance indicators like search volume, cost-per-click and competition level. The software also offers insights for search questions, collates lists of proven keywords used by competitors and shows related keywords in a clear, tree-view system. Beyond the basics, there are plenty off tools to keep you using the software, from position tracking and competitor analysis, to website audit and backlink research. There’s even a tool dedicated to generating content marketing ideas, which could be particularly beneficial when it comes to producing different types of content around a similar set of keywords. Completing the list is SERanking, an all-inclusive, cloud-based SEO software. The cheapest of our suggestions (depending on which package you choose), SEranking counts over 200,000 users –including more than 12,000 small and medium businesses – and offers in-depth keyword analysis behind a clear, modern interface. The smart, one-click keyword suggestion process collates valuable short and long tail keyword suggestions from a database of more than 2 billion search terms and organises them by popularity. Meanwhile, the platform’s Keyword Rank Checker offers accurate tracking of organic and paid keywords in 14 countries. Delving deeper into the software’s advanced features, users can also benefit from competitor SEO and PPC research, backlink checking and monitoring. Particularly handy is a deep website audit which analyses your domain for errors and provides actionable recommendations to help you improve website performance. Verdict – a sleek, versatile piece of software with the potential to grow with your business at an attractive price point. However you do it, keyword research is a vital stage of developing any content that goes online. The suggestions above aren’t exhaustive, but they are tools that we’ve found useful in the past, particularly when working to more conservative budgets. What are your thoughts on our alternatives to SEMrush, and are there any other pieces of SEO software that you’d recommend? Leave us a comment below!